When Washington Redskins director of pro personnel Alex Santos finished his college football career at North Carolina State, he had his eye on a coaching job.He was working at Vanderbilt University as a quality control graduate assistant when Hurricane Katrina hit. College scouts from the southern region sought refuge at Vanderbilt in the days after the storm. Santos was there when scouts began studying films of football talent, and they picked his brain for input. It was then he realized he had a knack for scouting and evaluating talent. Now, leader of the team tasked with recruiting for the Washington Redskins, Santos talks with Hispanic Executive about the art of scouting and what it would mean to be part of Super Bowl-winning franchise. 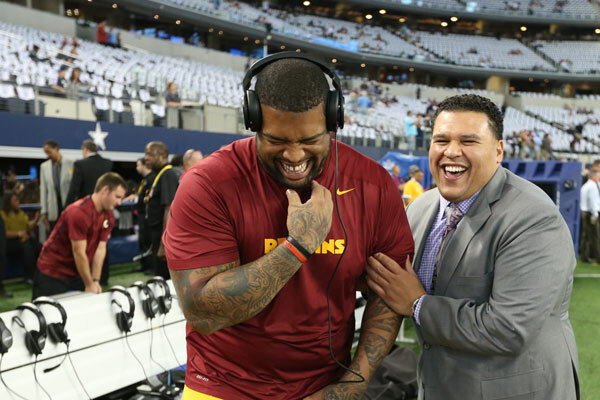 Offensive tackle Trent Williams (left) and Director of Pro Personnel Alex Santos (right) at the Dallas Cowboys’ AT&T Stadium. Can you give us an overview of your role as director of pro personnel for the Redskins? I manage the evaluation of active NFL talent to ensure we have the best possible players on our team or we are ready to acquire them if they become available. I assess our opponents, free agents, players that may get released, or possible trade prospects. I continuously update my emergency list so that I’m always one step ahead if a player needs to be brought in. Having current knowledge of all of the teams in the NFL in the event that players may become available is essential. What are some commonalities you look for in players regardless of position? Mentality is most important. I want players who have good football acumen and who are willing to work to be the best that they can be to help us win. They also must have a sense of team; it is impossible to do this on your own. Football is the ultimate team sport, so bringing guys in who buy into a team ideal or philosophy is ultimately what I look for. Are there any particular schools, conferences, or areas of the country that you gravitate toward when looking for talent? There are some conferences that have an abundance of talent. Some colleges have more talent than others, but overall, talent is widespread whether it’s Division I, II, III, or historically black colleges and universities. It’s rewarding to find a player from a smaller school or one that isn’t as highly touted who is able to make a contribution to the organization. Finding those players that are considered a steal in the draft or a college free agent is a great feeling. There is a lot of talent at the collegiate level, but the key is finding players who best fit the team’s needs. How do you determine which players could be steals in the later rounds of the draft? I always wonder how someone like Tom Brady didn’t get selected until the sixth round. [Finding the best players in the draft] isn’t an exact science. Every team has hit and missed on players in every round. We have an extensive evaluation process, reviewing all of the information including athleticism, character, background, and medical history before making a selection. Obviously the Patriots hit on Tom Brady who, along with other players, has played a large part in that franchise’s success, and the rest is history. If everybody knew that Tom Brady was going be Tom Brady, he wouldn’t have been drafted in the sixth round. Injuries can make or break a team’s season. How much do scouts take into account a prospect’s injury history? How does a scout/franchise decide that a player’s talent outweighs the potential for injury? We have to maintain a constant balance between talent and injury history. There are lots of players that get banged up, some more than others, throughout their college careers or in the NFL. We try to find the balance between risk and reward and hopefully come to a consensus that is in the best interest of both the player and the organization. What’s been your favorite part of the job so far? The process we go through to find players. The film study and the dialogue we have among ourselves when one of our scouts brings up a player or identifies a player who can help us are the most exciting moments. Constantly scouting new talent when the need arises due to an injury. You want to address that need or fill that spot without much of a drop-off. You also hope that the player you bring in is an upgrade and will play just as well or better with the team. Injuries are obviously part of the game. Every team has them and has to find a way to overcome them. It’s a big challenge, but a welcomed one. What would it mean to you to help your team win a Super Bowl? We have three trophies in our lobby now and we walk past them every day. I haven’t been a part of a Super Bowl-winning franchise, but it would be a great achievement. To bring a Super Bowl win to the nation’s capital would be monumental. We have a great fan base and a passionate owner in Dan Snyder. It would mean a lot across the board for the players, coaches, fans, and all of those associated with the team. Above all, it would truly be great to see Mr. Snyder someday hoist the Super Bowl trophy.